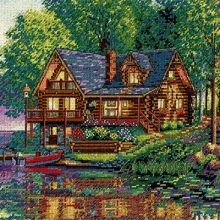 Find yourself by the water and enjoy the view of a quiet scene in this counted cross stitch design. Spending time at this cozy cabin is the perfect remedy for the stress of everyday life. The colors and subtle shading of this design are just magnificent! This inviting scene is stitched with warm shades of cotton thread on 18 count ivory Aida in a combination of Cross and Half Cross Stitch. Kit con..
An English cottage, surrounded by cobblestone and flowers, and cool stream glistening in the afternoon sun is depicted in counted cross stitch. A cobbled path runs along the stream where two elegant swans are there to greet any passersby. Continuing along the garden path, you will find a quaint cottage just ahead. Stitched on 18 count ivory Aida, this warm and inviting scene is stitched using Half..